Accommodation in various price ranges nearby Harpa has been booked for participants since Reykjavik could be quite crowded during the conference period. To secure the accommodation of your choice, we recommend that you submit your registration with hotel booking as early as possible. Bookings are made directly via the registration form or send us an email. Including: Instrument-tied knots, instrument handling and safe surgery. Needles and suture materials, interrupted stitches. Continuous suturing and self-locking knots. Repair of labia and 1st degree tears on medical models. Including: Diagnosis, classification, sutures, needles and instruments. Training on medical models. Healing and follow up. Interventional program: Including Perineal support during 2nd stage of labour. Lecture and training on medical models. Gel, spray, infiltration. Pudendal block: Transvaginal and transcutaneous. Entonox, epidural, spinal, thermal therapy and medicine. All payments are done via on-line credit card payments. Accepted credit cards are: VISA, MasterCard, Diners and AMEX. On-line payments are guaranteed through secured site. Individual accommodation will be refunded if cancellation is made 72 hours before arrival date (working days). Note the cancellation is not confirmed until you get e-mail confirming the cancellation. The organizers cannot be held responsible for any financial loss resulting from exchange rate fluctuations. Alda Hotel Reykjavik combines a fantastic location, on Reykjavik‘s main shopping street, Laugavegur, with a harmonious atmosphere. The boutique style hotel, where rooms vary in shapes and sizes, offers a calm escape. Alda is located on the upper end of Laugarvegur (otherwise known as the quiet part), around a 15-minute walk from the center of the city. Near shops, cafés, and restaurants but away from the central nightlife area. To see the exact location and distance between the hotel and congress venue click here. 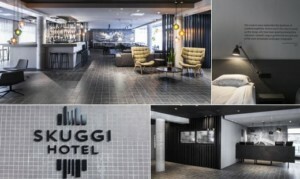 Skuggi Hótel is a brand new hotel in the city centre. Timeless, modest and clear-cut design reflects the style of the Hotel. At Skuggi hotel you will discover all the best that the Reykjavik has to offer, in addition to the exquisite service and excellent location. The hotel features a hundred well designed rooms all equipped with standard amenities for a comfortable stay. 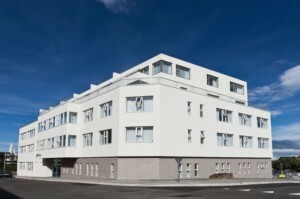 Storm Hotel is located in Thorunnartun 4 between Reykjavik’s main business district and Laugavegur shopping street. Near Storm Hotel is Laugardalur where you can find variety of different recreation like one of the largest Swimming pools in Iceland, Reykjavik Park and Zoo, the botanic garden and more. 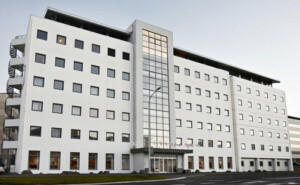 Marina is a 155 room hotel located in the up-and-coming downtown harbour district, the Icelandair Hotel Reykjavik Marina is not just another hotel in Reykjavik. 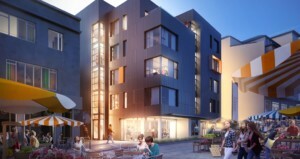 Instead, this hotel delivers a more authentic Reykjavik experience, by synthesizing the city’s rich maritime history with its, vibrant present day culture. The hotel is probably the only hotel in the world where you can almost touch the huge vessels in the dry dock, but the main entrance of the hotel is on the north side of the hotel. To see the exact location and distance between hotel and conference venue click here. Fosshotel Reykjavík, Iceland’s largest hotel stands prominently in Reykjavík’s business district, only a short walk from the main shopping area. Here, from the heart of the city, you can easily explore Reykjavík’s magnificent architecture, captivating history, vibrant markets and rich culture – ideal starting point for experience the best of everything the city has to offer. With 16 floors, many of our rooms offer magnificent views of the city and the bay area. The top floor features seven suites, 2 that can be used as meeting rooms and on the second floor you will find first class conference facilities. Unwind at the Beer garden with local Icelandic draught beer and enjoy select dining at Fosshotel Reykjavík’s restaurant, Haust. 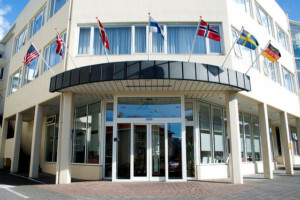 A historic hotel which stands prominently in the heart of Reykjavík, near the seafront and a short walk from Reykjavik’s harbor. The hotel stands near the seafront, within walking distance from many popular shops and attractions. 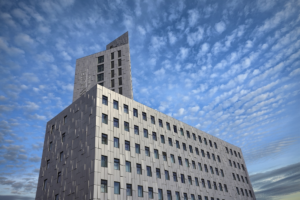 Enjoy a scenic walk by the seaside, visit the prestigious Harpa Concert Hall and try some of Reykjavík’s great restaurants and cafés, all just a stone’s throw from the hotel. 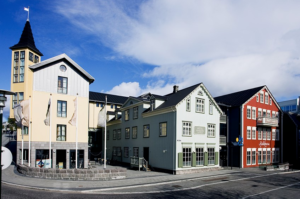 Fosshotel Rauðará is a quiet, modern hotel located just a few minutes’ walk from the Reykjavik’s main shopping street and most popular attractions. The hotel has 85 comfortable and spacious en suite rooms. 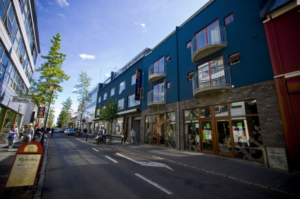 The hotel is in a short walking distance from Laugavegur shopping street and Reykjavik City Park called Klambratún. 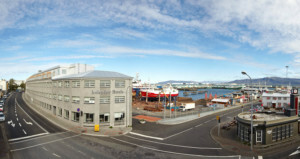 With Hallgrímskirkja church only 1 km away the location is perfect for those who want to explore Reykjavík at its best. Hotel Frón is located on Reykjavík’s main downtown shopping street. This four floor, 94 room hotel, with elevator, provides its guest with a selection of accommodation, such as single and double rooms, studio apartments as well as larger apartments. All rooms have a bathroom, mini bar, telephone, television and a safe. All apartments have kitchen facilities, a refrigerator, microwave oven and a cooking stove. The hotel offers a remote internet connection and DVD players. 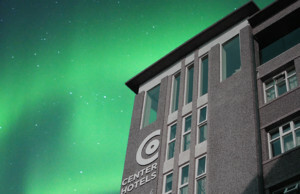 This downtown Reykjavík hotel stands in the bustling city center within walking distance of some of Iceland’s the best museums, restaurants and bars. When you stay with us, you’re staying at a modern hotel in a prime location, only a stone’s throw from downtown and the best of Iceland’s shops, entertainment, bars and world-class dining. We encourage you to ask us about our city as we want you to like it as much as we do. The hotel has 166 rooms, of which 143 standard rooms, 20 superior and 3 family rooms. The standard rooms are modern, bright and well equipped, ranging from 19 to 21 sqm. Our stylish superior rooms are located on the top two floors and are more spacious, including a sitting area with two chairs and a table. Of the twenty superior rooms, ten have with private balconies and five offer stunning views over the sea and to the mountains. On the ground floor we have an inviting and a spacious lounge, a cozy bar and a dining room where breakfast is served. There you will also find a game room with a pool table as well as a TV corner for the kids. On the first floor you’ll find our souvenir shop and tour desk where we are happy to help you book your travels with most tour operators. The hotel’s name derives from the large boulder (‘klettur’ in Icelandic can mean either ‘large boulder’ or ‘cliff’) which has been left in site on the ground floor of the hotel and appears to be bursting out from the wall. The overall appearance and design of the hotel is inspired by Icelandic nature and, more specifically, Icelandic rock formations. Arnarhvoll and its surroundings boast an extensive choice of services and amenities for business, holiday and leisure. Each room has it’s own private bathroom, free high speed internet connection, flat screen TV, shower, hairdryer, tea & coffee making facilities and a mini bar. 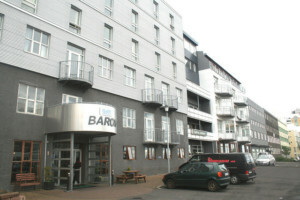 Located by the shore opposite the Harpa Reykjavik Concert Hall and close to Reykjavik’s main shopping street, Laugavegur, the hotel offers an ideal location for exploring the historic center; shops, restaurants, cafés, bars, nightlife and all main city center attractions can be found within easy walking distance. At Canopy, we’ve got you covered. Our rooms and suites are styled in shades of ocean and volcanic rock and have all the comforts you crave. Just-Right Rooms have a 48-inch TV, mini-refrigerator, bedding designed exclusively for Canopy for comfier, better sleep – and the WiFi is on us. Suites offer even more space to stretch out in a living room. Local art fills the walls in our boutique rooms and suites. Book your own rental car via Hertz to receive a 20% discount. If you book a car for more than three days, you will also have a free GPS and be able to add an additional driver for free . You can also click directly on the Hertz logo or book through the widget.